Taking a dog for a walk is excellent exercise, and a way to reduce stress. 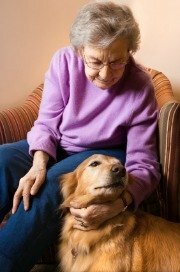 You make more friends if you have a dog, and for single seniors, a dog makes a house seem less lonely. Having a dog has health benefits including lower blood pressure, better cholesterol, and less chance for obesity, since dogs require walking on a regular basis. A pet comes with certain responsibilities, costs, and lifestyle changes that need to be considered. The loss of a dog brings real grief and pain as outlined in the following story. Trudy loved her trips to the Beauty Parlour. The groomer remarked on her weight loss, more noticeable now that her golden coat was shorter. I was less concerned, because the Vet had been telling me for some time that she was overweight. Some weeks later Trudy suddenly stopped eating, and after a couple of days it was apparent that she was quite ill, so a visit to the vet was arranged. ‘She looks poorly’ he said ‘I’ll run some tests, come back in the afternoon’. Perhaps it’s something she ate, I thought, he’ll prescribe some medicine and she’ll be fine in a couple of days. ‘When should I consider ...’I couldn’t, and didn’t have to finish the question. ’Even now’, he replied gently. I can’t do it, I thought, not now. Let me take her home for one more day and see what happens. Besides I must speak to my family. That night I sat with Trudy until about 2am, stroking her forehead, giving her sips of water, and whispering softly to her. And I hoped against hope she might be improved next day. In fact her condition deteriorated significantly, as predicted. I phoned the vet. I could hardly speak. He knew what my decision was. ‘It’s quiet here now if you want to bring her in’ he said. I carefully lifted Trudy and carried her to the car. She sighed as if embarrassed that she could not walk. She rested limply in my arms and flopped uncomfortably into her favourite seat. She looked at me, as if pleading for help. Trust me I thought, you always have. I will take care of you. The journey to the vet was just about ten minutes. I spoke to her all the way. And then a lovely thing happened. She roused herself turned towards me, and I just know what she wanted to say-don’t worry, it’s going to be OK, I do trust you. I left the surgery, phoned my wife and children and then made my way to a church to pray. I was crying for Trudy and for all of life’s partings and losses. And I expressed gratitude for ten wonderful years of laughter, love and loyalty. Thank you Trudy for touching the best parts of me, and thank you for trusting me in the end. After Trudy’s death it would be some years before I was ready to enjoy again the benefits of pets for seniors.